"We went back to get him, at the rest stop, before continuing on to Grandma and Grandpa's house. But that was the last time your brother ever said your father's head smelled like the bathroom after the neighbor with lactose sensitivities used it. He rode in silence for the rest of the trip." I have a crush that is so bad and so fierce that Tyra Banks just cut off all its hair. All I want to do is think about it and talk about it, live it. I am horrible and pathetic and I can't stop. I am a Curtis Sittenfeld character. While I attempt to get it together (Come visit me like Cross Sugarman. In the night! 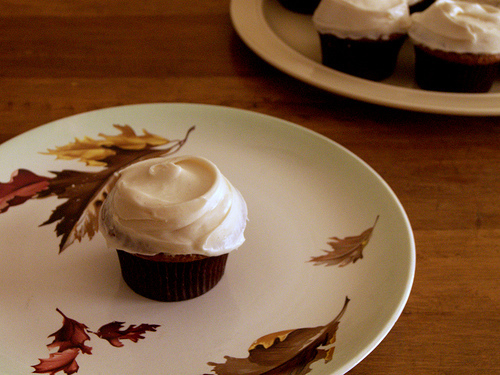 ), please enjoy Fall, and these cupcakes. They went over well, except everybody thought they were pumpkin. Preheat your oven to 350 degrees F. Sift together the flour, spices (cloves, nutmeg, cinnamon, allspice) and soda. Set aside. In a large bowl, whisk together the brown and granulated sugars, egg and oil until well-beaten and smooth. Add the vanilla extract and stir until combined. Add the flour mixture and applesauce alternately, beginning and ending with flour, mixing just until flour disappears and batter is a uniform brown. Spoon or scoop into a lined 12-cup cupcake pan -- I got exactly 12 cupcakes from this recipe, but depending on the size of your cups, this could vary by 1 or 2. You can also grease and flour a round cake pan and pour the batter in that, baking for slightly longer (until toothpick comes out clean and top springs back gently when touched) and then frost, or just sift powdered sugar over the top. But we're dealing with small cakes today, class. Bake for 10-15 minutes, checking after 10, just until toothpicks inserted in the middle and edge cupcakes come out clean or with dry crumbs clinging. No wet batter. Remove from oven and cool in pan for 5 minutes, then gently remove and cool completely on a rack. For the icing, beat together (don't whip) the cream cheese and vanilla extract with an electric mixer (stand or hand) on medium speed until smooth. Add the cinnamon. Then gradually add the powdered sugar until you've reached a sweetness and stiffness level you're satisfied with. Frost cooled cupcakes generously, slather them, obscenely. Enjoy. Just made this. I used blackberry applesauce instead of regular. So delicious, thanks. I am still so surprised whenever anyone comments on my blog -- thank you. I feel like I should call you all sweet doves or something like that. Canaries. Thank you. GIG, thank you -- a thrift store find, and I was so psyched to be able to use them for something. Lisa, for sure. This was fleeting, it has died down thankfully, but it was one of those ones that was deep and full in high school and I guess the embers hadn't died down. My whole body was like southern California all week. Now we're cooling down. Thanks, low pressure system. Beth, we totally stand together. Baking For Distraction. Meetings every Wednesday at the Grange hall. Cakespy, thank you! I'm flattered you clicked through, and I hope you enjoy your time here. Oh choice, Smitty! You made my day -- I'm glad the recipe didn't poison anyone or burn your house down. I bought my applesauce at a local Whole Foods style store, and it happened to be both adjectives. Otherwise, feel free to use an applesauce that fits either of them. Holy cow those look yummy, I'm a sucker for apple anything. Thanks for sharing this recipe! I ran home and made these last night, brought them in to the office this morning. The icing was surprisingly good, despite the lack of good old butter, and the cakes smelled divine. They were a fall-time hit at work. Couldn't find chunky and unsweetened applesauce in the same jar. Where did you get yours? Oh, and thanks for the fun recipe! I just came across this blog through a link on another one (I was curious about the name!). And what a reward! What beautiful photography for one thing...that frosting looks as sweet as your crush! Another person that bakes when they can't stop thinking about someone! But yeah, I know the feeling. And these look fantastic. Your photos are so beautiful, L! Mmmm, a crush in fall. I think that even beats the crush in spring -- the crisp air, the sharpness of the light, that sense of everything teetering on the brink before winter's misery... ahhh. The cupcakes look good too. I love apple cake. Heart the plates! Just in time for fall! !